The government’s demonetization move has impacted a wide swath of Indians, but no industry has been affected as profoundly as the banking industry. With ATMs shut, bankers are working overtime, and harried customers have been queuing outside banks in record numbers to withdraw cash. Tensions, understandably, are running high. ICICI Bank has acknowledged that these are difficult times, but has said that’s no excuse for misbehaviour from customers. 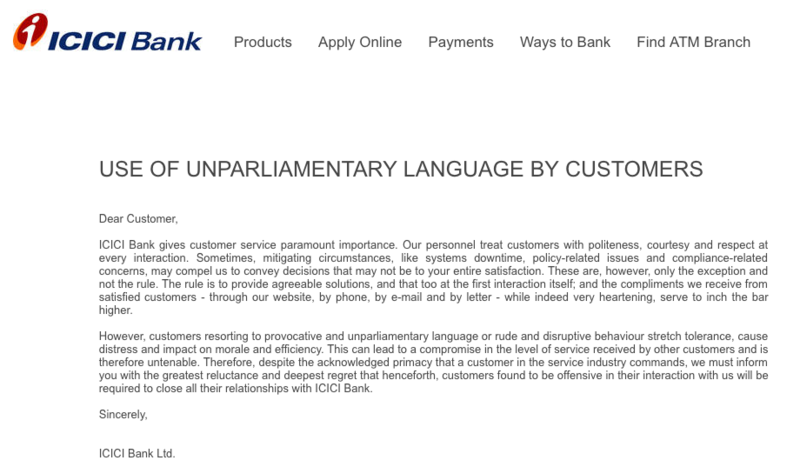 In a note titled “Use of unparliamentary language by customers” that was visible to the bank’s online users, ICICI has said that sometimes mitigating circumstances such as “policy-related issues” might cause deficiencies in their service, but that doesn’t give customers the right to abuse its staff. It’s a firm, yet fair, stance, but it probably underscores the extent of the problem. ICICI wouldn’t have had to come up with such a directive had rude customers not been a big issue. But with millions of cash-starved customers at its bank branches, it’s possible that tensions are spilling over at its bank branches. While harried customers might feel hard-done by the move, they should realize that the bankers on the other side don’t have it any easier.